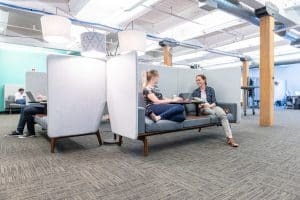 by: Malana Panaro, Operations Manager – resident space planning expert, who can usually be found optimizing furniture placement, crawling under desks, or tracking staff behavior patterns from behind leafy plants. If I had a dollar for every time during our office space expansion I answered the question, “will we have a fireman’s pole between our two floors?”…well, I’d have enough to put in a fireman’s pole! That falls into the category of Fancy Money, though, and that’s not RealSelf. This concept of avoiding Fancy Money features was one of my guiding lights when determining how to strike the right balance in our most recent office space expansion from one 24,000SF floor to two. 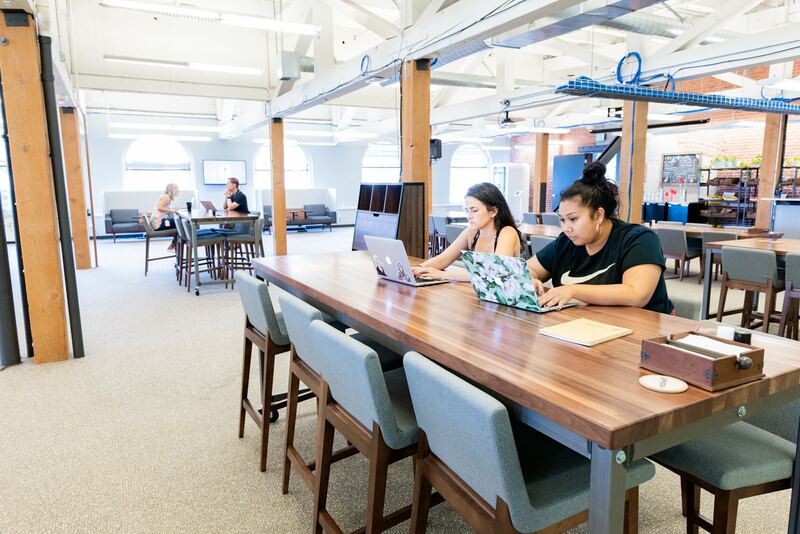 As a company, we see great value in our staff being physically together, so it’s incredibly important to provide an office in which people want to work. This is at the core of how we approach space planning. People need to come together to collaborate, then they need to go be alone to do the work. And along the way, they need to be fed as human beings, both literally and figuratively. The Gathering Area at RealSelf is home to collaboration, team meetings, company All Hands, and many delicious shared lunches. We invest in our staff as our most important asset, so keeping them connected and fully supported to make their magic is absolutely essential. Another of my guiding lights is taken directly from our company values of being Customer Centered, which is shown through Leading With Empathy. In that spirit, I did a few key things that kept our staff experience front of mind in my plans. I spent a lot of time in the shared spaces of our current office watching how people used what we had and the workarounds I could eliminate through better design. I also worked in different desk seating areas of our office at different times of the day to get a sense of the rhythms of the teams. It’s understood that Engineering needs differ from the needs of Sales, but how did that show up for our staff specifically? I asked questions of our staff. Specific questions when I saw behaviors I didn’t understand as well as general, open ended questions to try to learn what I didn’t even know I didn’t know. I listened. I was open to admitting that what I thought I knew could be wrong. I experimented. I got vendors to let us demo furniture to try it out and then solicited staff feedback. I tried things in our current space to see if I should scale it in our future space. I toured other offices. Any office anyone would let me into. I peered into spaces when elevator doors opened onto unknown floors. And I asked their Operations teams what worked (sometimes unexpectedly) and what didn’t (again, often unexpectedly) so I could benefit from their learning. the Transformation Room containing hanging hammock chairs with gauzy fabric to pull around cocoon-style and disconnect for a bit before returning to face the world. I created intentional places for multiple types of tasks, taking into consideration the amount and type of light, nearby noise, and proximity to teams most likely to use it. 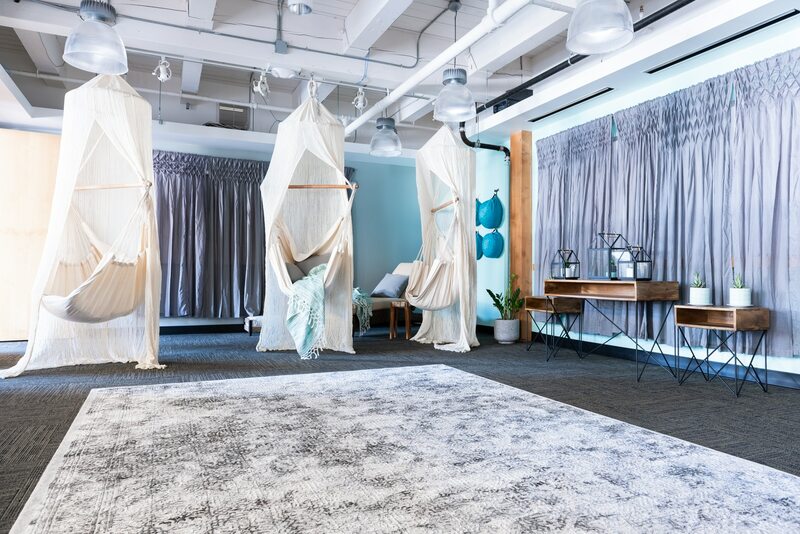 The Transformation Room hosts our weekly mindfulness and yoga sessions, as well as team strategy sessions and decompression time when it’s needed most. I read. A lot. Trends are fascinating and I like to dig in to see which we can leverage and which seem gimmicky and fleeting. Two years in a row, I attended the largest annual commercial interior design trade show, Neocon, in Chicago. I packed my time with seminars to learn everything possible from strides in Mother’s Rooms to experiential design trends. I walked the multiple floors filled with all of the latest in office furnishings – looking for furniture that is the trifecta: Functional, Comfortable, and Flexible. Functional – it has to serve a current need and fit with how we naturally work. I’m pretty sure I tried out every single phone booth option out there, and there are a lot these days, before a clear choice was evident. We currently have 10 and they have been one of the best investments I’ve made. Comfortable – it doesn’t matter how cool or beautiful furniture is if no one wants to use it. I personally sit in/on/at every piece of furniture, like Goldilocks ruling out an astounding number of offerings that are just horribly uncomfortable. Flexible – the only thing I know for sure when I’m designing space is that by the time we move in, our needs will have changed. And they’ll change again before long, so everything should be able to fulfill multiple purposes and be on casters for easy movement whenever possible! Also, I choose finishes that are very neutral for furniture and add the pops of brand colors using paint and changeable accent pieces. Well chosen furniture should outlast ever-changing trends. Our one-on-one booths are perfect for the regular connection points between people and their managers, and formal or informal collaborations. Lastly, I knew that the change to having our staff on two separate floors, even within the same building, was going to be a hard shift for our tight knit group. We believe in the power of Accidental Collisions, so I created intersections for that to happen – those unexpected moments of, “hey, I was thinking the other day about that project you mentioned and wondering if this new feature I’m working on might fit with what you’re doing.” Research suggests that we interact 100 times more with those near our desk than those more than 150 feet away, so in addition to encouraging people to utilize further flung shared spaces for a change of scenery (there is a different type of shared space in each quadrant of our office to draw people to areas away from their desks), we also placed some snacks and drinks only on one floor or the other to keep people running into each other in casual moments when we most naturally connect on a human level rather than strictly through formal meetings. What makes your heart sing? When our staff invites family members into the office to introduce them to their friends at work and because they’re proud of where they work, I’m pretty sure you can hear the song of my heart louder than my laugh echoing off the beams. Our space is really beautiful and I love being around when people experience it for the first time. And, I love being around every day when people are utilizing it in the ways I imagined and planned for as well as in the ways I didn’t anticipate but can use to plan for the future.